No need to worry about damaging the walls or flooring, whether you're playing on the traditional bulls-eye board or the ring target. SUPERB MAGNETIC STICKS LIKE GLUE: Board constructed by top-end rubber steel and velvet, darts get stick immediately as they land on the board without slide or fall, darts have no point yet actually stay in place with reasonably accurate. Good value item for indoor game and easy-fixing at home, office, or clubs as great stress reducer as well as keeping hand-eye coordination skills honed. 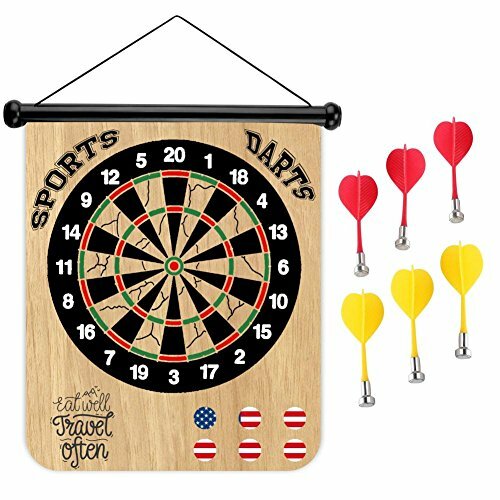 GREAT ALTERNATIVE TO REGULAR DART BOARD: The darts comes without needle part which is much safer than traditional dartboard with sharp points for children. Flexible cloth-covered board protects the wall or furniture behind it and rolls up to store conveniently, can be hanged anywhere you want with the stripe on top of the board. Perfectly sized: This dart board is sized so you can perfectly see where are you throwing your darts from a decent distance. It can also be used as a nice decor for your wall. It measures 15" X 18" with a weight of 1.5 pounds. PORTABLE,DURABLE AND HANGING EVERYWHERE: The board is easily rolled up and put away in the canister it came in, and just as easily unrolls to hang back up. You will Love that it can be hung anywhere such as hang from a doorknob and, therefore, is easily movable... The magnetic darts also stick to other magnetic surfaces; bonus fun for the dishwasher, fridge, etc. GREAT GIFTS IDEA: A wide variety of fun games of skill can be played using this safe, for exercise and relax, great for children and adult, boy and girls, safe and interesting, suitable for more than 6-year-old kids and adults indoors and outdoors. 100% satisfaction guarantee and you will enjoy life-time warranty. Enjoy flawless outstanding play now! If you have any questions about this product by Sports Home, contact us by completing and submitting the form below. If you are looking for a specif part number, please include it with your message.